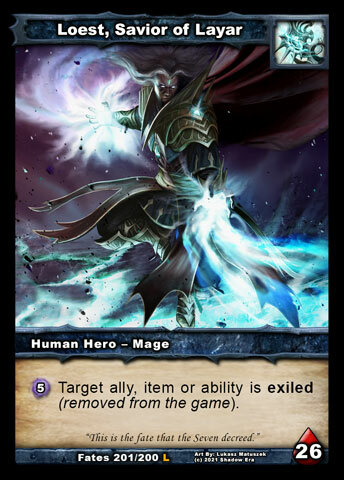 In today's article, I'm really excited to share with you more information about the mysterious race of people known as the Aldmor, in terms of all the related cards from Dark Prophecies onwards until we arrive at three new spoilers from Lost Lands. I highly recommend following the links to the wiki as you go along, to get some context for the lore as it is presented. 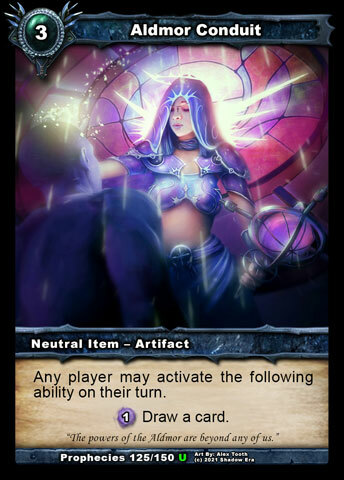 The Disciple of Aldmor 's part in the story began when she left The Wilds with Rothem, after he had acquired the know-how and pieces to assemble the device he intended for his ascension. She remained with him while the device was constructed, acting as translator in some cases, to ensure no mistakes were made. 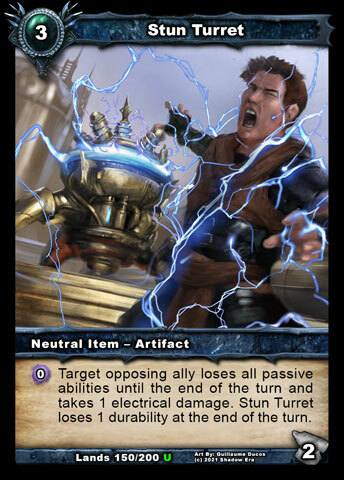 But, as we all know from the existing lore, the device did ultimately fail, killing both Rothem and Loest in the process. 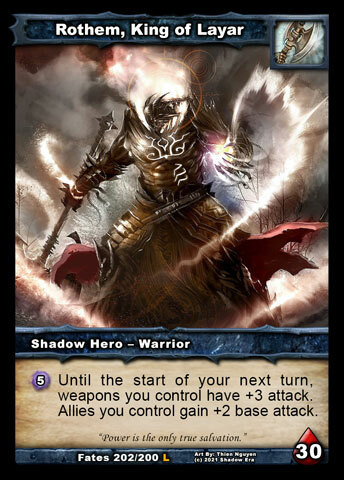 In fact, the huge shockwave of shadow energy killed all those present except a single witness, who later returned home to re-tell the story of Rothem 's demise - the story that had led to her accompanying him in the first place! 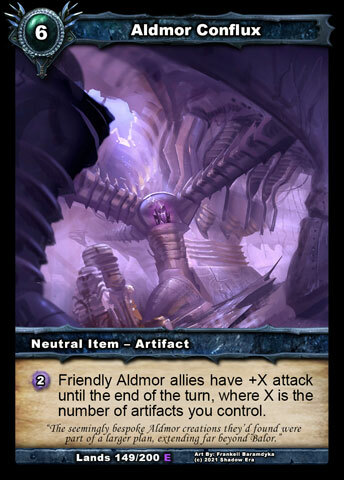 At one point, however, a great threat to the unfolding of that story was in play, in the form of the Aldmor Conduit that Rothem had brought with him from The Wilds, believing it to be a working prototype of the much larger device he was envisioning. 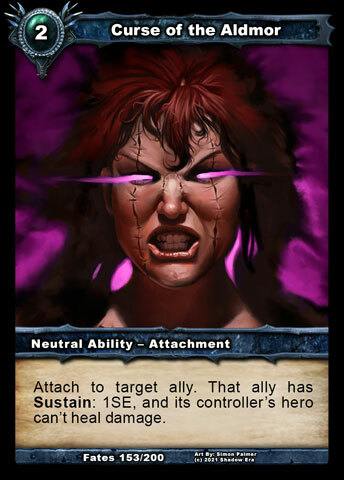 That threat was only averted when the Disciple became aware of it, after Rothem asked her for a demonstration on their journey across Balor, and then shortly after discarded it, telling inquiring minds at the time that it no longer worked. In reality, as she knew from her brief "failed" demonstration, it actually worked too well, offering its user and those in its vicinity the power to predict and alter the future. Rothem's impending fate depended on it being as far away from them as possible. 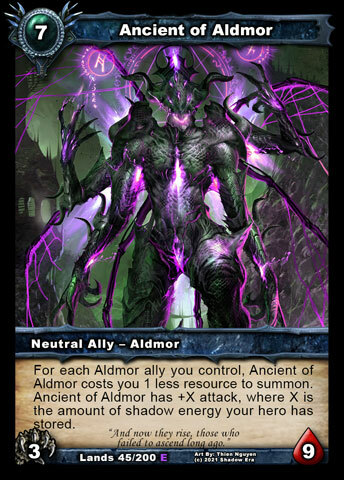 When the dark prophecy of Rothem's demise came to pass, the Aldmor's attention shifted to the other wielders of shadow energy, who some Aldmor believed could be dispatched with in a similar fashion, albeit on a smaller scale. Various devices were produced and scattered across Balor, intending to cause harm to users who were seeking greater power over the shadow crystals. Of all of them, what became known as the Aldmor Accelerator was the most potent, for two reasons: firstly, it did actually deliver that greater power and the price was gladly (and foolishly) paid; secondly, its capabilities could be projected onto others at will. Meanwhile, whilst many Aldmor celebrated what had come to pass with Rothem, a select few purists were vehemently opposed to playing any part in his downfall, or the downfall of other supposed heroes, even if only as a witness. 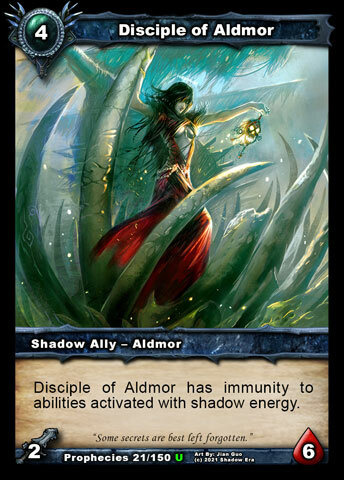 The Ascetic of Aldmor represents one such purist, who has departed from The Wilds, aiming to leave behind as much of her old life as possible, relying on only the simplest techniques of shadow energy manipulation to protect herself, and only using them when the odds were otherwise not in her favor. As word spread across Balor about the fate of Rothem, so did stories of the Aldmor. One such story spoke of a curse which had been put on one of his party when she left The Wilds, and that her presence with the curse had sufficiently interfered with his command of the shadow crystals. 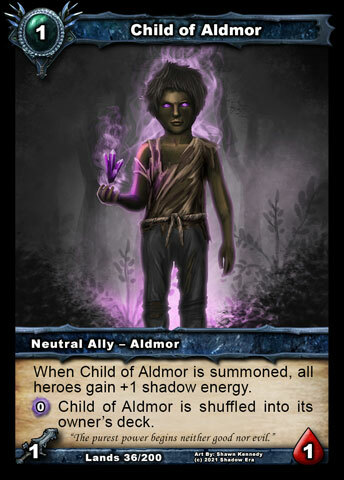 Despite an unquenchable curiosity for learning, the Child of Aldmor is largely ignorant of the war that has been raging beyond the shores of his home, where he has lived all of his young life, let alone the significance of the shadow crystals in that war or their terrible impact on Balor. Whilst the Aldmor have been utilizing those crystals for centuries, no Shadow Gates have opened there and none of the heroes have been seen up until now. The Ancient of Aldmor represents the antithesis of the child in almost every way; curiosity is not so much absent as redundant. The war of the crystals is etched into the very core of its being, and it has been sensing the flow of shadow energy in Balor and beyond for centuries. Long believed to be sleeping in the cavernous depths of The Wilds, it has actually been patiently waiting for the command to rise again. Alas, that command was unlikely to come from the other Aldmor themselves, as they hoped it would forever remain in its slumber. 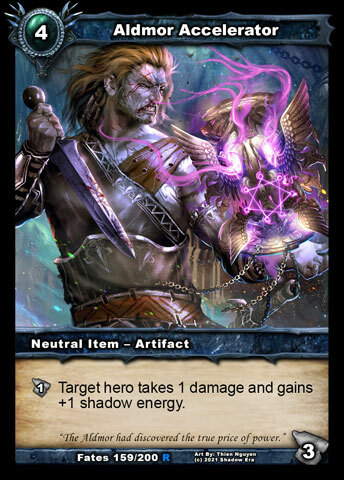 Instead, they engineered creations that could both harness shadow energy to protect their home and maintain the delicate balance of energy that the Ancient was attuned to. 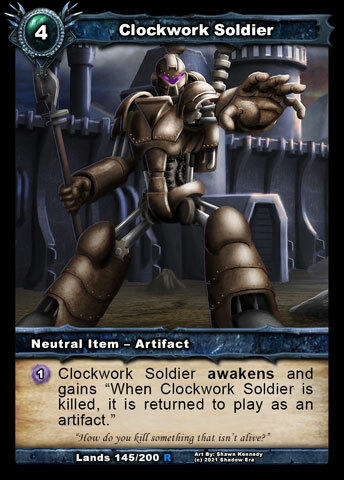 The Clockwork Soldier is a crude yet effective invention geared towards the former. With regards the latter, the Aldmor Conflux marks their greatest achievement to date. This vast machine is at the heart of a network of all other artifacts they have created, some of which were deployed on other worlds, channeling shadow energy back and forth to regulate the dynamic equilibrium. 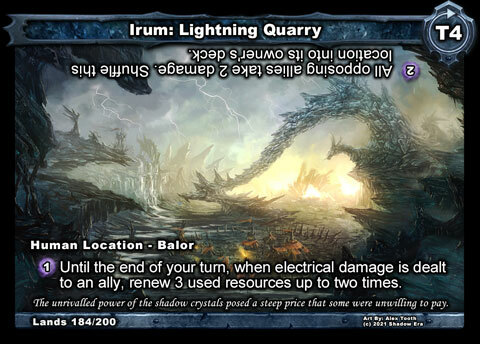 Unfortunately, the unrestrained use of shadow energy from crystals found beyond The Wilds in recent years brought fluctuations beyond its parameters of normal operation. Whilst it has successfully prevented Shadow Gates opening within The Wilds so far, the impact beyond has been catastrophic and it seems only a matter of time before the system is overwhelmed completely. Political pressure is mounting to activating its secondary mode of operation, for defense rather than for balance. Really cool stuff, cant wait! Looks awesome. Love all these story and background bits we are getting with these spoilers too. Edit: Speaking of the wiki, all revealed LL cards are there now. Last edited by tman507; 08-01-2015 at 12:21 AM. +1 For your self high-five. He's not readied when you turn him into an ally. You can use sac lamb and stuff like that on him and turn him back into an ally, but he won't be able to attack immediately on his own.